Great Weather is Finally Here...What an awesome weekend. Nice weather, the final Mountain Goat training run, driveway basketball, yard cleanup, mowing and the Junior Prom. 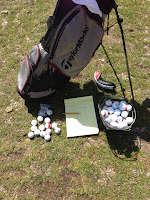 I even had a few minutes to swing my new golf clubs for the first time (I bought my last set in 1988 when I was 17!). 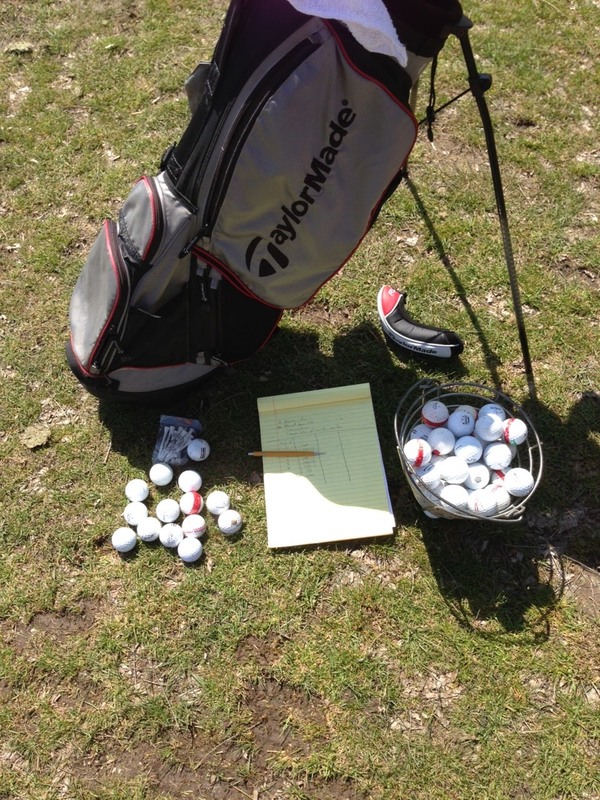 I even used my trusty yellow pad to record my new yardages in my older age! Prom and Senior Ball...As my wife and I rolled up to the Junior Prom on Saturday night, she reminded me that this was the 27th Junior Prom or Senior Ball that we have chaperoned together. Add in ALL of the other dances, events, and festivities that we have chaperoned together, I think we would qualify as professionals! I always have it easy... I just put on a suit and tie and show up. My wife has had to find 27 (and soon 28 in a few weeks at the Senior Ball) different things to wear! We have had a blast chaperoning all of these events and Saturday night was no different. 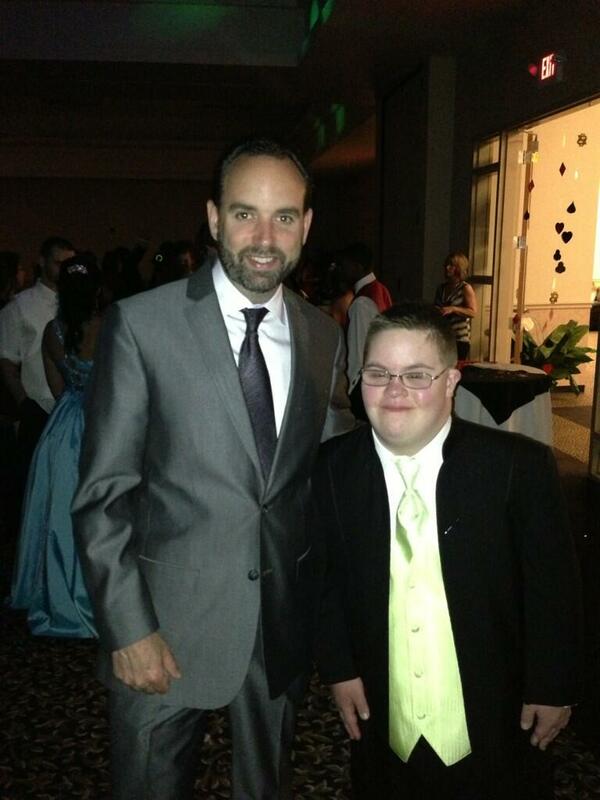 We had over 425 students in attendance and there was a variety of tuxes and dresses on our students. Not much has changed in this area over the years, but one thing that has changed is the music. I have a really open mind for music and enjoy most of what the students listen to. Where I struggle is how they dance. I have no moves. At all! I get jealous when someone has taught the kids how to "Dougie", "Gangnam Style", or the "Wobble Dance", and all I can do is stand there and bob my head a little. Yes, I can Foxtrot, two-step, and even do the Harlem Shake. Those do not cut it today. I think I see some "professional development" in my future. You should be proud at how our students represent themselves at our dances. They are polite, respectful, and have an appropriate good time. Next stop is the OnCenter for the Senior Ball! Thank you to all of the Junior Prom organizers and chaperones for another great time. Now and Going Forward...Spring sports are winding down, and we are creeping ever closer to our Fine Arts event Kaleidoscope 38. This means that we are even closer to final exams and graduation. Wow. This week is fairly quiet. Assessments are over, and I will be able to get back on my regular school visit schedule. Spring Sporting Events: Well, we had a pretty good week weather wise, and we were able to finally get some games in! On Wednesday we had every sport playing on our grounds except for JV baseball and Varsity track who were away. You should take an opportunity to come and watch our student athletes. Our facilities rival junior colleges, and our athletes are playing incredibly well. In fact, our girls lacrosse team is currently ranked number one in the state for Class A schools. Nice work! Helping Others is Important: Over the weekend I attended another OUTSTANDING fundraiser for a student in one of our schools with some medical needs. It is always amazing to see how quickly our community comes together to help some of our youngsters when they really need it. I am very appreciative as well of all the volunteers that I saw working for a good cause. Thank you. Q & A about Subjects from Previous Blogs: I have had some very good conversations and feedback from parents near and far regarding the two blogs that I recently posted about standardized testing, Annual Professional Performance Review (APPR), and the Common Core Learning Standards (CCLS). I would like to share a couple of the questions that were received and also clarify a couple of points. Question: Can a child fail a grade if they do not perform well on a state standardized test? Answer: A child will not fail or advance a grade based on their standardized test score. Question: Do students with disabilities have to take the NYS standardized tests? 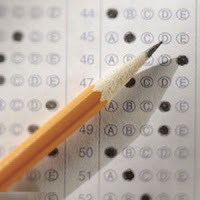 Answer: All students, including those with disabilities, are given the NYS standardized tests. If a student is profoundly disabled, they can be identified as testing exempt. That number is normally 2% or less of the ENTIRE student population. A student could be given support on the exam based on the level of disability and conditions that are prescribed in the child's Individualized Education Plan (IEP). Question: How do you treat a child who just had a "bad test day"? Answer: This is a great question. West Genesee has a K-8 Response to Intervention Plan (RTI) for Math, English, Reading, and Writing. New York State requires that schools have to provide a Response to Intervention Plan (RTI Plan) for grades K-4 in English ONLY. We chose to exceed this requirement two years ago so that we can better service ALL students. If your West Genesee K-8 student has a "bad test day" on a NYS Assessment (otherwise known as test), we go to the other internal data points that we have collected throughout the years to make a very quick decision as to how much support that child needs moving forward. 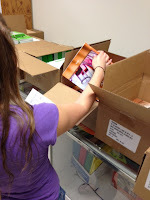 The beauty of the K-8 RTI plan is that if a child needs help, they get it quickly and appropriately. If they do not need the help, they do not receive it. I often forget that thousands of people read these posts each week and many are from other schools and other states. 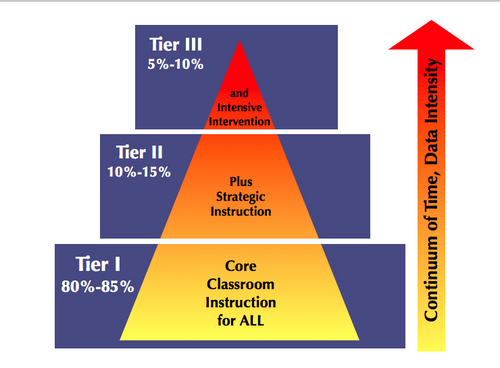 I would recommend that you check with your particular school to see how extensive their RTI plans are. In my opinion, the comprehensive coverage that our plan provides gives students and teachers the most flexibility. 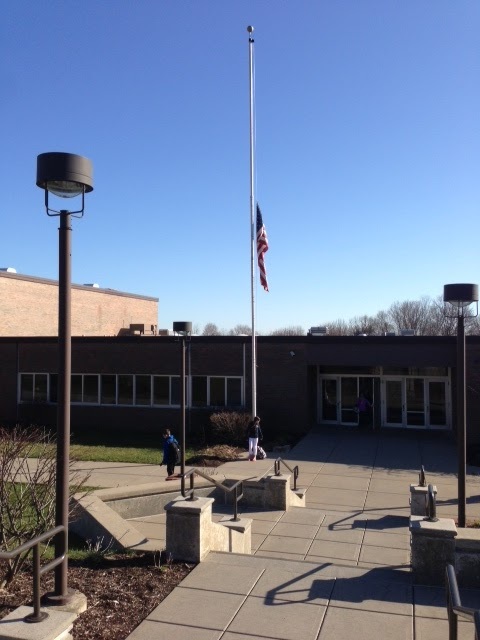 Flags at Half-Staff: Changing the subject, I also got a great question from a student regarding our flags. They wanted to know who can direct our flags to be flown at half-staff. 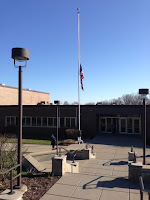 This is an awesome question and made me realize that our flags seem to be at half-staff nearly as often as full-staff these days, and that our younger students do not know anything different. ONLY the President of the United States, the Governor, and the Mayor of Washington D.C. (because D.C. does not have a Governor) can order flags to be flown at half-staff. Anyone that flies a flag at half-staff on their own without receiving a direct order to do so, is in violation of the "Flag Code". There are no "Flag Code" police, but most organizations try to be as respectful to the "Flag Code" as possible. Great question and learning opportunity for the students! The weather is looking up again for this week. I should have all the diplomas signed, and we should be well into our graduation planning by the end of the week. We are almost to the end. It goes without saying that the news coming out of Boston challenges our belief system. Our belief in our safety, our belief in what people are capable of, and our belief in where we go from here. On the other hand, many marathon runners crossed the finish line and immediately went to give blood, many race volunteers and emergency personnel ran TO the dangers that existed to help victims, and many race spectators and participants stayed in the restricted area to help those who were injured. Our Nation responds strongly and in a unified way when confronted. It is this confrontation that causes people, especially middle and high school students, to ask questions, feel uncomfortable, and wonder if we are indeed safe. This is natural. If I learned one thing from being a superintendent on 9-11-2001, there will be a lot of information learned in the next 12-24 hours that will provide clarity to the situation (it is 8:20 p.m. on Monday evening as I write this blog). There will also be a lot of rumors and false story lines as well. Our staff will not add to that. We will listen to the students as this situation unfolds and answer questions that they might have. If they are having difficulty, we will make sure that they are referred to a counselor as we do with other situations that arise. The Boston Marathon is a very popular and very well attended race. I am sure that a parent, student, or staff member was in attendance, so we just want to make sure that anyone who needs it gets the proper support that they need. Thank you and let's hope for swift justice. I hope that all of you had a good week. Someone who did not have a great week is our Athletic Director, Mr. Burns. Due to the weather, he had to spend a LOT of time rearranging games in every sport. Luckily, it looks like we are heading into a decent stretch of weather which will allow us to get all of our games and contests caught up. Also, a big congratulations to my better half, Mrs. Brown. She completed her first half-marathon yesterday in Central Park, New York City. She and about 9,000 other female runners had some wonderful weather and scenery to raise money for a great cause. We do everything together, so it was weird not to run with her (as it was a female only event), but it was pretty cool to cheer and watch her cross the finish line! In my last blog I discussed standardized testing, and I mentioned that in this blog I would discuss the Common Core Learning Standards (CCLS) and the Annual Professional Performance Review (APPR) for teachers and principals. I could use this space to get incredibly technical about both topics, but I don't think that would be as productive as a quick overview about each and how education today is being impacted by both programs. In September of 2011 I mentioned to staff on opening day that anyone who was still working after July 1, 2012 would have to fasten their seat belts and be prepared for a pretty bumpy ride into the future. I also mentioned that our profession as we know it was going to change so radically that all of us "old dogs" (myself included) would have to learn some new and complicated tricks! Unfortunately, I think my prediction was pretty accurate. Common Core Learning Standards (CCLS): In the most simplest of terms the Common Core Learning Standards represent a shift in how and what students will learn in each of the core subjects. The initiative starts at the lower grades in English and Math, followed by Science and Social Studies and will then roll forward into the high school. The Secretary of Education, Arne Duncan, feels that the "CCLS" are necessary to become more globally competitive. His belief is that if ALL children learn the same things throughout their school experience, then they will be equally or more competitive as they enter college, the work force, or the armed forces. The material has to contain more complex concepts, more quickly, and students need to be constantly challenged. This link http://www.corestandards.org/in-the-states outlines in graphical form all of the states and territories that have adopted the "CCLS" to date. Virginia, Texas, Nebraska, Minnesota, Alaska, and Puerto Rico have yet to adopt the "CCLS". For our children, the "CCLS" means that they will be asked to learn more abstract concepts at a younger age. For example, in math what WE (1970's-early 2000 graduates) learned as children in high school will probably be taught in some form as early as elementary school. In English, more non-fiction material will be used than fiction material so children can make connections to real life concepts more quickly. The "CCLS" prescribe for teachers exactly what has to be taught. The schedule is aggressive so some teachers will find it frustrating that they cannot teach some of the topics that they have ALWAYS enjoyed teaching because they have to stick to the standards due to the timing of testing. I do think that as teachers become more familiar with the material and as more efficient means of testing become available, the space to be more creative in the classroom once again will exist. That certainly won't happen this year, in my professional opinion. 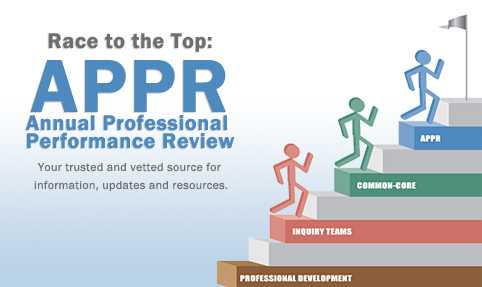 Annual Professional Performance Review (APPR): At the same time this is happening, our teachers and principals are being evaluated differently and for some this evaluation mechanism is the first time that an actual number and "grade" is being assigned to their performance and the performance of their students. Teachers and Principals also have to collect "evidence" of student work, and they are required to show student growth through the use of data. The stress level surrounding this is high because everything is new, there is significant work required to collect "evidence", the transition to teaching the "CCLS" itself, the inability to be creative (at least for now), and the fear of how students are going to perform on the State Assessments because officials at the State "would not be surprised" if results are lower this first year. We are fortunate... Our teachers are experiencing all of the above, but as I walk hallways and classrooms during the school day you would never know that any of this stress exists. I see the stress break through in after school meetings, professional development sessions, and in faculty rooms on occasion which is perfectly normal for ANY organization experiencing this type of change. So, the big question is...will I sign a petition against testing or against the "CCLS", and if not, will I be angry with people that do? No and no. As I tell my staff life is very, very short. Their work is their work, and their family time is their family time. If staff give their best effort and students give their best effort each day, everything else will work itself out no matter what they are asked to teach or learn. Bottom line... I do believe that through a small window of time all of the bumps that we are experiencing will level out. Even if I was fired up about it and wanted to refuse testing or the "CCLS", I am not in a position where that decision would matter to anyone. Only the Commissioner of Education and the Board of Regents can alter our course. We will make it work as long as they are asking us to move in this direction. As for anyone else, parent, student, staff who might sign an anti-testing or "CCLS" petition, that is certainly their right and I would NEVER hold that against them. We are moving forward in the direction we were given. If someone wants to express their viewpoint, I might not agree, but I will ABSOLUTELY respect their views. I could attach about two dozen links to this blog about testing, "CCLS", "APPR", etc... but I did not. If you are interested in all of the guiding information that is out there and you have Internet access, just do a quick search for "New York Common Core Learning Standards" and you will find what you need. If you would like me to send you more information, please do not hesitate to contact me at cbrown@westgenesee.org. Have a wonderful week, and I will write again soon. I hope that all of you were able to squeeze in at least a little relaxation time over the break. It is hard to believe but we are about two months away from the end of the school year already and I am having a hard time wrapping my head around that. Standardized Testing: As we enter what has been coined "testing time", I wanted to take a moment to publicly answer a question that I have received many times this school year: What do I think about standardized testing and parents choosing to have their children opt-out of state testing? A Parent's Right: These questions are more complicated than they seem. For starters, I think that every parent has a right to direct and care for their children as they see fit. With that being said, I would not advise a parent to have their child opt-out of testing. The information that the classroom teacher obtains from testing is used to make "individualized" education plans for children. This can actually help a classroom to run more efficiently and can help a student receive the instruction that they need to receive instead of being blanketed with information because strength and growth areas are not known. I will certainly honor a parent request but would make it clear in the student record that we as a school have had our ability to work with their child compromised by the wishes of the parent. 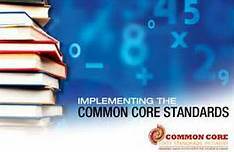 Common Core Learning Standards: New York State assessments reflect information that has come from the new Common Core Learning Standards. It is not a stretch to believe that results are going to be lower than usual for at least this year. This is because the correct, aligned, curriculum is not available (especially in math), and our teachers are teaching what they can find to the students. This will level off next year as curriculum becomes more available. Also, if many parents elect to have their students be "absent from testing", the school could fall out of compliance with New York State which could cause teachers to be moved (up to 50%), and that is not productive either. Any score on a New York State assessment is not going to, and has not, impacted college placement four to eight years down the road. My 14 years of Superintendent experience tells me this. This does not mean that sitting in front of a test and not knowing the information is not stressful. It is, but I blame that on lack of curriculum more than the test itself. Personally speaking, I think the lack of curriculum is a larger problem than standardized tests. If we had adequate curriculum, it was taught correctly, and students were as prepared as possible for "testing time", we would probably not be talking about opting out of testing. Because this is a blog and not a book, I have not touched on the impact of the professional performance review process or the impact of the Common Core Learning Standards on the way things "used" to be in a traditional classroom. These are very important topics, and I will write about them later when I have more space.